The city of Mesa, Arizona is officially playful! Mesa, Arizona recently proclaimed its commitment to play by unveiling the sign that designates it as an official Playful City USA! Mayor Scott Smith and children from the local Webster Elementary School (pictured below) teamed up to show off the new sign. They couldn’t have picked a more ideal location! 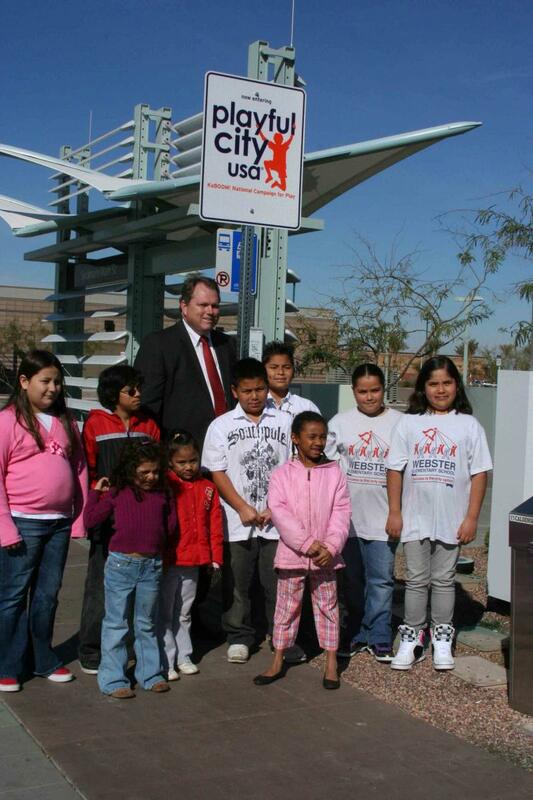 The sign is planted at the light rail station, which connects Mesa to the rest of the Phoenix metropolitan area and serves as an unofficial entrance to the city. Now, anyone traveling to Mesa via light rail will understand its deep commitment to making play and physical activity a priority. Playful City USA is our national recognition program honoring cities and towns across the nation who champion the cause of play. They take annual actions to promote play, conduct audits of all available playspaces, and work towards creating legislation that makes play a priority. The program helps communities show that they prioritize health, activity and play as issues of great importance, particularly when it comes to fighting childhood obesity. In 2009, KaBOOM! recognized 93 playful cities in 33 states. These cities and towns also host annual Play Days, celebrations of all things play-related and a chance for the communities to gather together. Another Playful City USA, Palm Bay, is hosting their Play Day next month, on March 20, 2010. Is your city playful? The 2010 Application for Playful City USA has just been announced! Find more information and apply.